A versatile set of features and a superb feel earn the Valentine modern classic status. Middle position doesn't offer a whole load of tonal versatility. We'd like a more easily adjustable boost. In terms of off-the-shelf electrics, Ernie Ball Music Man is best known for its formidable artist roster, which counts some of the instrument’s most outstanding proponents among its signature endorsees - John Petrucci, Steve Lukather and Steve Morse to name but three - but one name that may have flown under your radar is James Valentine, lead guitarist for pop heavyweights Maroon 5. The band’s material may not be your cup of tea, but make no mistake, Valentine knows his guitars, and this affordable version of his signature model makes a compelling prospect indeed. 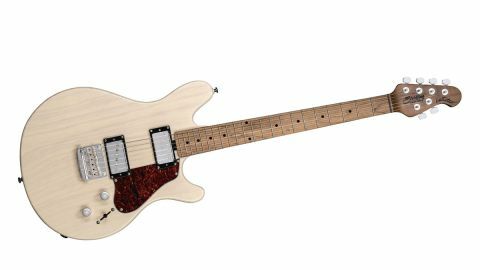 Loosely designed to marry Valentine’s favourite attributes of a Telecaster and an ES-335, the resultant shape is a curious hybrid that feels familiar and contemporary in equal measure. Its body cuts a comfortable figure that looks and feels instantly classic - it features contouring around the heel for easy access to the dusty end of the fretboard, but true to its Fender inspiration, there’s no belly cut. The overall package isn’t overly weighty like some slab bodies can be, yet it’s reassuringly rugged, and looks sultry indeed with that transparent Buttermilk finish and tortoiseshell scratchplate. While it’s based on two classic outlines, the Valentine has a few tricks up its sleeve. For one, that ain’t two humbuckers you see before you - no, sir. In actuality, that bridge pup is a single coil, lending the instrument the tonal palette of a HS Tele, à la Keith Richards’ iconic Micawber. Except most Teles don’t come fitted with an onboard boost: pressing down on the Valentine’s volume control adds a full 12dB of additional volume to give your amp and pedals a good kicking. It should be noted that the Sterling incarnation loses the full-fat Music Man version’s coil-split and adjustable gain levels, but then again, this one clocks in at under a third of the price of that USA model. Any number of factors can affect a guitar’s tuning during transit, but when we pull one fresh out of the gigbag in perfect tuning, it usually bodes well, and, accordingly, the Valentine is rock-solid during our time with it: a hardtail bridge paired with a set of Sterling locking tuners on the 4+2 headstock means there’s no cause to touch the tuning machines, other than to test their smooth-operating action. There’s a great feel all round: getting your hands on the Valentine reveals a gloriously light satin finish to the roasted maple neck - it’s an eminently playable setup. If you can’t stretch to Ibanez’s AZ line, this electric offers a similar palm-filling yet swift feel for a little less. Tonally, this guitar can certainly cop a decent impression of its two forebears, while retaining a flavour of its own. The balanced neck single coil is a blank canvas ideally suited to chord vamps and background rhythm work, while the bridge pickup is like a supercharged single coil - it’s smoother, more balanced than the spiky tones that can sometimes emit from bridge singles. That said, although the middle position dulls the bridge single’s highs with input from the neck humbucker, it still leans heavily towards treblier tones - not quite as varied as perhaps hoped. Unless you want to blow your audience’s eardrums, the onboard boost probably isn’t something you’ll switch on and off during a clean tone, but you may find yourself leaving it on all the time, depending on your amp and pedal setup. So many valve combos sound better with a boost up front, and this 12dB kick sets you up with some record-ready clean sounds. As you’d expect, the transparent boost comes in handy when you need to push existing gain over the edge for a sweet sustaining solo, too, and serves up a little more of everything for rhythm heft. We’re big fans of Valentine’s no-nonsense approach to guitar design. While there have been small concessions in bringing his signature model to a sub-£800 price point, there’s no arguing with the quality feel and workhorse performance, while the addition of that built-in boost elevates the whole package. More versatile guitars are available for this kind of money, but few offer the sheer class that Valentine has delivered.